Today’s post is a guest post from my friend Tony, whose Factory Software Blog is an excellent resource for software, factory automation and… pens! Tony was a technical reviewer for my book Industrial Automation: Hands On and provides a different perspective on the world of automation than my “heavy industry” view. 1. Compact size. A FP Sigma with 288 digital I/O takes up less than 6″ of DIN rail space (150mm wide x 90 mm high x ~80mm deep), while a FP2 with 768 I/O takes up less than 16″. On occasion, I’ve had to stuff a lot of unplanned I/O into a small space, so the compact size has been extremely useful. 2. Good support of IEC-61131 programming in the FPWinPro software (including structured text which we like). 3. Easy to communicate and control via a PC using the MEWTOCOL protocol (we do a lot of PLC/PC communications). The FP0R includes a standard mini-USB connector, and it’s easy to make a Tool Port serial cable for all models using a 5-pin mini-DIN plug. 4. Transistor I/O modules use standard 0.1″ box headers instead of terminal blocks, so it’s very easy to use them with custom break out boards (we create a lot of custom break out boards). 5. Stepper motion commands in most models (including the FP0R); we’ve used this capability with integrated stepper motors when we only needed a few simple motions. Dedicated, high speed motion modules are available for the FP Sigma and FP2. 6. Reasonable pricing, including for the FPWinPro software. Other software pluses include no hardware or software “keys” to lose, and a free basic (or demo) version of FPWinPro that is fully functional but limited to a maximum program size of 2.7K. 7. Panasonic has been good about keeping compatibility. For example, the FP0R has a FP0 compatibility mode. 1. Only the FP2 has single step or modify while running capabilities. This means sometimes you have to be a little more creative when debugging, although all models support monitoring, variable tracing, and setting the minimum cycle time. 2. Although Panasonic covers the basics, the range of modules isn’t as extensive as some competitors. For example, there are no AC input models. 3. Panasonic isn’t the most popular. My impression is that they’re more popular in Asia and the US West Coast. 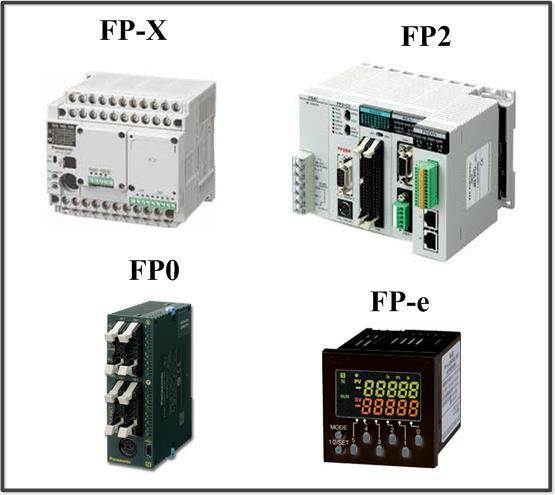 • The FP0R and FP Sigma very compact brick-style PLCs. • The FP2 backplane PLC; this is the high end model. • The FPX which has traditional terminal blocks. • The non-IEC 61131 FPWin GR software is also available. I wasn’t impressed when we used it a very long time ago; it should be better by now. Online pricing is available from Online Components, Allied Electronics, and probably others. Does anyone know anything about the release of the FP7 (fast, 1 gig of addressable memory, etc.)? The US HQ told me in October they were supposed to be out in mid to late November, but to date the regional guys still haven’t heard anything about it. I have no idea about Panasonic’s future plans, and I’ve heard that the US guys often don’t have a lot of clarity into what HQ in Japan is doing. About the only Panasonic PLC gossip I’ve heard is that the FP-X was developed at the request of a large Asian customer, which makes sense since it’s so different from the rest of the lineup. Something with lots of memory is likely to be a x86-based PAC (Programmable Automation Controller); think Omron Sysmac NJ or similar. thanks for your information, we also using Panasonic PLC for many years.just because the first time i use PLC the brand is Panasonic, this is a habit.